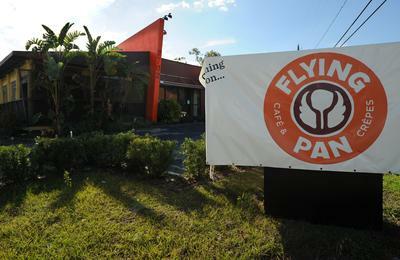 TAMPA What Chipotle has done for the burrito, the Flying Pan hopes to do for crepes. The international chain of crepe restaurants is set to soon open a location in Tampa on Kennedy Boulevard as a prototype for U.S. expansion. Credited as a French concept, the thin pancake-style wrapper has become yet another new motif for entrepreneurs on the hunt for the next fast-casual concept to capture American tastes, following made-to-order style restaurants based on themes like Italian flat breads, Indian and Chinese. The restaurant is going into the former Bin 27 location at 2702 W. Kennedy Blvd. In many crepe restaurants, chefs will work in open kitchens where customers can watch them pour out the crepe batter onto a circular hot griddle and give it a delicate flip when ready. Like Chipotle, customers typically pick from a huge variety of ingredients — either savory for entrees or sweet crepes for breakfasts or desserts. Besides independent crepe restaurants like La Creperia Cafe in Ybor City, other crepe chains have opened around Tampa, including Ooh La La Crepes that has four locations in Florida, including one in WestShore Plaza. The Flying Pan takes the crepe concept and elevates it into a more upscale and quirky dining scene for a full restaurant. Breakfast items include a “Rise & Shine” crepe with baby spinach, two eggs, tomatoes and hollandaise sauce. Savory crepes for lunch or dinner include a “French Countryside” with duck, brie, red apples, caramelized onions and morel mushroom sauce. Sweet crepes include a “Suzette” with butter, white sugar, orange juice, orange syrup, whipped cream and ice cream. Most crepes range from $4 to $8, with a full combo basket totaling $10 to $14 with drink. Flying Pan rounds out its menu with chocolate fondue with bananas and strawberries, smoothies, gourmet coffees and even hot dogs for kids. Like a Chipotle or Panera, customers will walk up to order and watch their food made fresh, but the location is a bit more upscale, with a full wine and beer list, and a decor that’s modern eclectic. Crepes may seem an automatically French idea, said Darren Tristano, restaurant expert at market researcher Technomic, but crepes can be found at scores of restaurants and food carts in England, Germany and Spain. The parent company of the chain, BFC Retail Group, originally started with one Crepe Cafe in Australia in 2001, and has since expanded to more than 30 locations in more than a dozen countries. For the U.S. market, they retooled the restaurant into the Flying Pan. If all goes according to plan, the Kennedy location will open in March, with 10 or more other franchise locations across the region in the next few years. This entry was posted on Monday, February 11th, 2013 at 5:57 pm and is filed under Expansion Strategy, Food, Franchise Activity, Future Plans/Announcements, Growth, Ingredient, Menu Development/Innovation, Menu Trends, New Product Tests/Mentions. You can follow any responses to this entry through the RSS 2.0 feed. You can leave a response, or trackback from your own site.